It is cucumber season, which in my books means it is time to make some pickles! My cucumbers are in full bloom and every morning I walk out to pick more and more cucumbers. Last week I made Manitoba pickles, but I think the time has come to make classic dill pickles. The second question is easy to answer in a few quick words. The blossom end contains enzymes that can cause softening of your pickles. Remove at least 1/16th inch from the blossom end in order to give your pickles a fighting chance at being nice and crunchy! 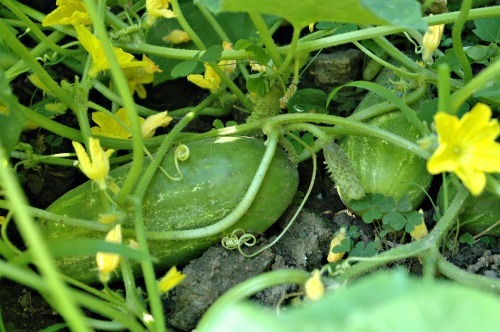 If you are picking the cucumbers from your garden it is easy to determine the blossom end...it is opposite to the stem. But what do you do if you are getting the cucumbers from a farmer and are just not sure which is the stem end? 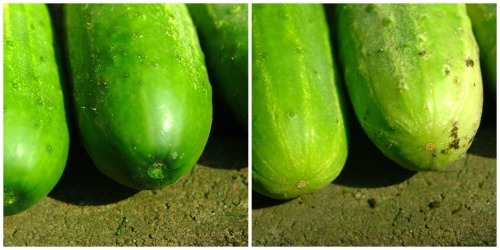 The stem end is indented and smooth (left image), the blossom end is rough (right image).